The popular imagination is continuously intrigued and arrested by stories of art theft. Works of fiction (and non-fiction) like the saucy film, The Entrapment or the best selling novel, The Heist capture the minds of audiences across the world and further validate the mystification of the artists and the art works. People are interested in stories of art crime for the same reason they are interested in stories of crime, investigation and action but also because of the added layer of charisma of a work of art. The value of an artwork is immeasurable and often the topic of debate and awe in news. Art is desirable, glorified, untouchable (display units in museums) and un-buyable (expensive). Or is it? In actuality, the art world is much like any other industry or booming business. With the increasing globalization, the art world does not remain unaffected. Art is no longer just a novel taste of the elite; it is also a commodity, an investment asset, a product and a status symbol. Moreover, art is accessible and available to be experienced and bought in the consumerist fashion of the contemporary lifestyle at international art fairs. International exhibitions are not a new phenomenon but the rate at which they are escalating is dramatic; till around the 1970’s the world knew of only 3 art fairs but by the 2015, that number grew to over 250 international exhibitions by the names of fairs, biennales, triennials and such. The difference between art fair model and the biennale/triennial is mostly a conceptual one. The former focuses on the art market, sales and commodity side of the art while the biennale model traditionally pays attention to the art discourse, issues of curation and universal critique. Regardless of the format of the exhibition, the shift from the regional gallery model to this international large-scale exhibition has been the turning point for the art world. 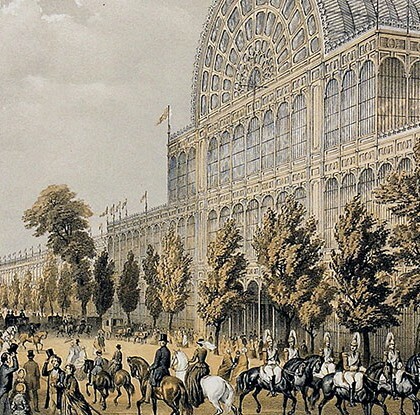 In her colonizing fervor, England hosted the first ever Great Exhibition at Hyde Park in the custom-built, Crystal Palace in 1851. This exhibition mainly displayed manufactured goods, craft, material and some Fine Arts. The event exhibited displays from countries around the world. And each country’s section showed arts and craft, skillful products, jewels, cultural assets, everyday objects of use etc. It is said to have attracted about six million people over a course of six months. The revenue generated from the exhibition was used to set up the Victoria & Albert museum, named after the royal family’s support in organizing it. Despite its obvious success, the exhibition met with criticism from various quarters of the society. The intellectual elite, artists and designers especially criticized the superficiality of the exhibition, deeming it as tacky and vulgar. In the international circles, the exhibition was often regarded as a symbol of English conceit and vanity. At its best, the exhibition was a demonstration of the national power and prosperity of England and at its worst; the discourse around the exhibition problematized the representation of the Victorians in the aftermath of the colonial rule. 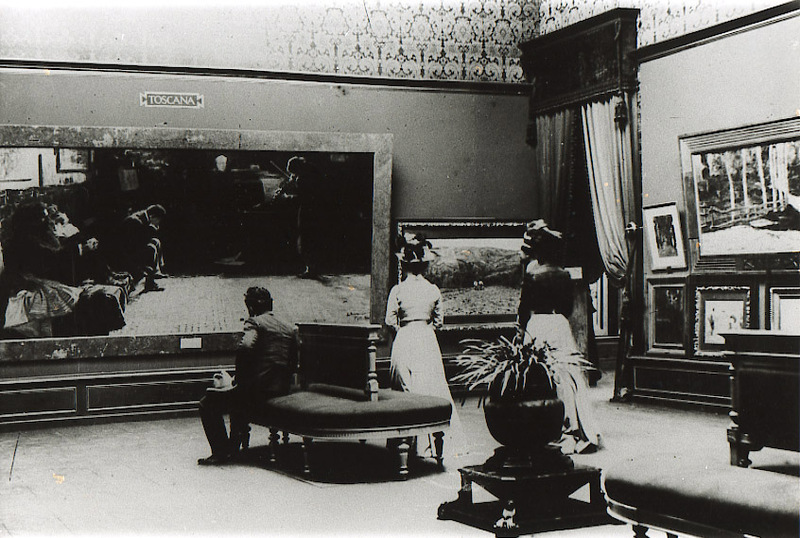 Although, the Great Exhibition was fashioned on similar examples of exhibitions already held in Paris, however, the very first sample of an art fair with celebrity artists, dealers and buyers is claimed to be Salon De Refuses in Paris 1863. 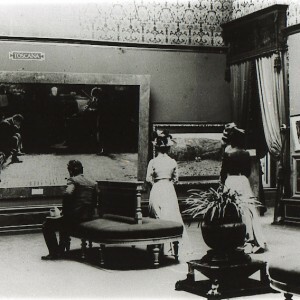 The exhibition was an open retaliation to the juried exhibitions of the time; showcasing works from the Impressionists. The very famous artists of history, like Manet and Courbet, contributed paintings shown in the ‘Exhibitions of Rejects’, but at the time these artists were controversial figures and among the rejects. Their works did not fit the conservative taste of the realistic style of painting, selected by the French Arts Council year after year for the annual exhibition. The Venice Biennial came about in 1895 for the very first time and to date marks a tradition of over 120 years. The biennial was initially set up as a platform for Italian art with a small section for international artworks. But by the 1920’s, it became the juncture for avant-garde art by initiating to show works from impressionists and post-impressionists. The biennale kept on adding international pavilions and except for the interruption by the World Wars, the exhibition kept on growing into festivals of other art forms like film, music and dance. Today the biennale program is one of the most intensive across the world with kids carnivals, education programs, architecture exhibitions, and cinema and theatre workshops. The Venice Biennale sets the example of the experience that the cities of the world are pockets of culture and art. Its not about the countries and nations, its about the cities, communities, and what they represent within themselves. There are so many cities in the world that now host art fairs, biennials or triennials. Some of the examples are Istanbul Biennial, Sharjah Biennial, Sydney Biennial, Yokohama Triennial; Art Dubai, Sydney Contemporary, Documenta in Kassel which follows the one in 5 years model. Then there is Art Chicago, Art Basel Switzerland, ARCO: Spain since 1980. Over the years, the identity of the art fairs is so closely intertwined with the culture, tourism and popularity of these cities that it is difficult to say which came first. The cities build on their revenue and tourism through hosting these art fairs. The regular programing of international exhibitions and festivals is connected to building industry linkages, governmental support programs, education and economy. Take the example of the Art Basel Miami. Ever since the addition of Miami chapter of Art Basel, we see the union of Miami Beach town; a hub of parties, tourism, sea sports, and tropical weather with one of the biggest art events world has see. The other two chapter of Art Basel are in Hong Kong and (initially) Switzerland. Each venue provides a unique culture of socio economic blend to offer representation to artists from USA, Asia and China; and Europe respectively. But Miami legitimizes the inclusion of entertainment, recreation and socializing to the art fair agenda of talks, discourse and workshops. Through the Art Basel, Miami has done for art what Vegas has done for casinos. The increasing globalization has a major role to play in creating a suitable environment for curating international exhibitions. The opportunity to travel combined with cheap availability of air tickets provides collectors, art connoisseurs, dealers, tourists, travelers perfect avenues to witness art. Art Fairs provided a wider choice of artworks to buyers from across the world, hence they are more successful than the gallery model for the purpose of buying art. The Internet age furthers the capacity to link the world through the web to these events. And the access and connection of the art collector with the dealer, representing art gallery or the artist her/himself is easily established beyond the event of the art fair. Besides, these events are a perfect social scene and must be attended by the whose-who of the art world and show business. The international exhibitions of this scale are the most up to date version of the carnival in town. They are attended to see and to be seen. They are a status symbol and in terms of artwork prices, they are affordable. Biennials, on the other hand have a reputation of being more exclusive in the selection of curators and artists and in most probability the artists who have shown in art fairs reach the biennial stage after some sifting and by that stage have raised their prices very high. Hence, further distinguishing the art fair model from the biennale model. For the participating and aspiring artists, these biennials, art fairs and expos define the international art scene. Most young artists today would term success in their professional careers by participation in international exhibitions of that scale. Regardless of the increasing number of these exhibition platforms, it is to be understood that selection criteria for these forums is generally very exclusive and based on standards of quality of the art, years of practice of the artist and regional fame already achieved. Artists who have representation from galleries and institutes in reputable places often have a higher chance of showing in international exhibitions. Artists agree to pay very high percentages from their sales at these platforms in exchange for the undeniable exposure to their work and themselves. The outreach of the said international exhibitions is much more valuable than regional exposure. Artists get ample opportunity to promote their work and get visibility in front of a diverse crowd, and also network for future breakthroughs and connections. Such glorified advantages often come at the cost of big and small compromises. With the growing market for Asian, African, Muslim, women, LGBTQ or other minority representation art, the artists streamline the content of their practices to fit the global narratives about their own representation. Like fashion trends the popularity of certain themes and subject matter continue to rise and fall in repetitions. The artists win favors of the international art market at different points in their careers based on what they are selling and whether it is fashionable at the time or not. Hence the international art market is more unpredictable in its reception to newcomers and offers highly competitive spots to young artists. The criticism received at the time of the Great Exhibition still rings true for the international art world today. Its insensitivity towards subtle refinements in art proves it to be much like the show business. It follows trends and agendas based on political and economical preferences instead of ideological ones. Such exhibitionism is often ridiculed for its superficiality and crassness. The global art market, much like any other business is very much contingent on funds and profits for its success and maintenance. Artificial hikes in prices have become the subject of controversy in the art world time and again. Sometimes these controversies help build up the artists name in media before a major international exhibition. While other times the artists become the sacrificial goat, heavily praised and beautifully adorned. At the end of the day, the art dealer, the venue, the buyer, the reseller, all will make money, perhaps even more than what the artist makes on their own work. The art galleries have to pay heavy fee for participation at these events and in turn have to tax artists to keep the system working. To bear the cost of the booth at such an event, the gallery is not shy of over booking the stall with works and a preference towards commercial works becomes inevitable. With such logistical concerns, political and economical frameworks easily replace the cultural agenda. Art Fairs leave very little room for art criticism and discourse but perhaps that is the reason why most international programs; exhibitions, fairs and biennials lean heavily on developing an education wing or program to compensate for the heavy handed conversations about the M word (money), so widely frowned upon in the art world.